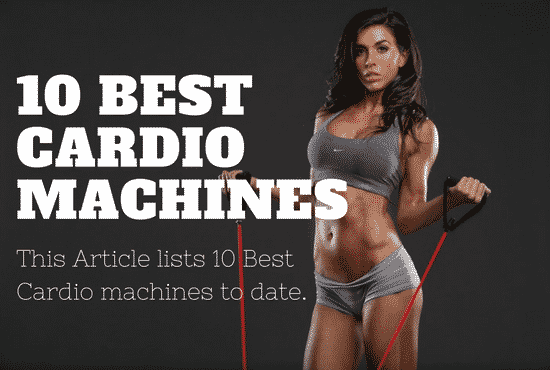 Are you dreading the cardio days? If you are spending more than an hour on the treadmill or elliptical every week; and not getting the desired results then you are not to be blamed at all until and unless you do not do anything about it. 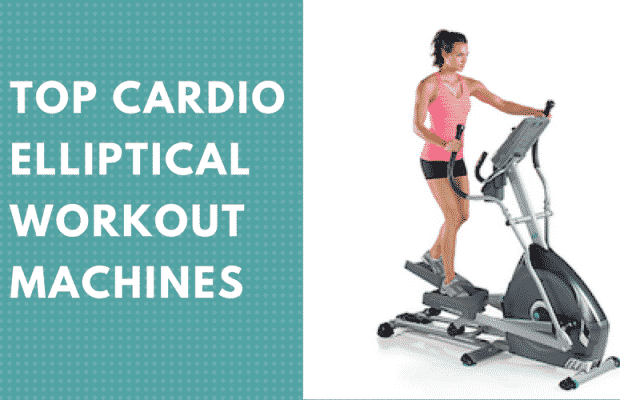 Cardio workout routines are what you need to adopt. With the underlined 5 training plans you will find it really easy to lose 500 calories only in half an hour. You should be geared up to run off each and every little bulge. This plan has been designed that is appropriate for all kinds of fitness levels. If you are fed up with treadmill then you may feel free to take the same routine outside. Without the digital speedometer, you may feel free to run for three minutes interval. Follow the link to know the details about this plan. You can shake the things up in order to enjoy faster results with the simple stepping dumbbell plan. You can add weight to your functional movements; you will work more muscles along with increased calories burned. It is recommended to make use of 3 to 8 pounds of dumbbells. It depends on your fitness level. In case you feel like losing balance, you should stay safe by weighing down on the console until you find your footing. Follow the link to know more about the stair master slimmer. This calorie burning plan makes use of the quarter mile sprints. It is between the body weight exercises to facilitate burning 500 plus calories. In this way, you will be toning your whole body at the same time. You will beat the boredom in this way and this is guaranteed. You will not have even a second to let your mind wander around. If you do not love to run, you should pedal your sprints or hop on to an indoor bike. You may follow the link to know more about the plan. Hold on a dumbbell or a weighted ball with both of your hands in front of the chest, stand with wide feet having your arms extended. Bend both the knees and pivot the feet to your left, having the ball lowered towards your left shin. Raise the ball overhead and pivot to your right. Repeat it 8 times and switch the sides. Allow yourself to fall forward on to the hands from a kneeling position. Slower your body slowly into a pushup and return to the kneeling position. Lie facing up with the arms being pressed into the floor, hells on top of the ball with your kneed bent. Cross your right knee out to the side while ankle on top of your left thigh. Press the left heel down into the ball, raising the hip as higher as you can. Hold on for 1 count and lower yourself down slowly. Lie facedown on the mat or the floor. Extend your legs and arms into “X” shape and do the jumping jacks in the same position. You should not spin your wheels on the stationary bike anymore. Kick your things up a notch with the aforementioned interval ride plan. All you need to do is to put the pedal to the metal and then feel free to ride it your way to burn 500 calories marked on this terrain. Click on the link to find details about the terrain interval rides. If you want to torch the fats in the real fast manner then poly-metric exercises is a sure way for you. 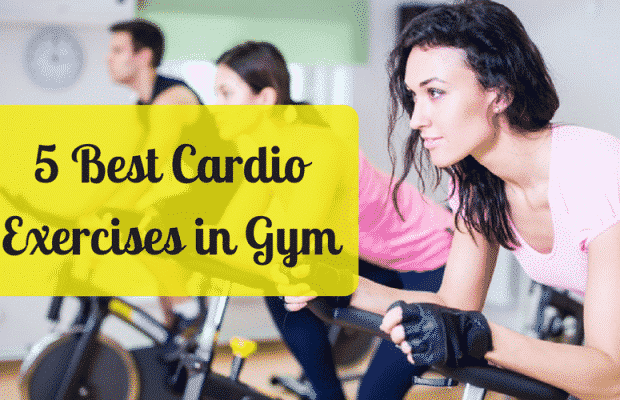 This will present you in the best jumping ways that can be done in the best cardio session. Do it as quickly as possible and that anywhere, anytime. It is perfect for all those who remain engaged in frequent traveling. Run in the same place, bring your knees to the chest as high as you can. At the same time, pump your arms as quickly as possible. Stand having your feet hip-width apart, keep the hands behind your head or keep them straight from the shoulders if preferred. Bend the knees to lower and push the hips back in the form of squat. Having hip-width apart, stand tall. With right foot, step forward, bend the knees in a way so that the left heel is lifted and right knee is over the ankle. Pause yourself at the bottom, push back to your starting position in a speedy manner. This is one set. Make a plank position, and alternatively run knees into the chest as quickly as possible. Keep the core engaged all the time and push the speed at your best. Stand with the feet having hip-width apart. Kick the help upwards towards the glutes, and at the same time pump your arms back and forth speedily. 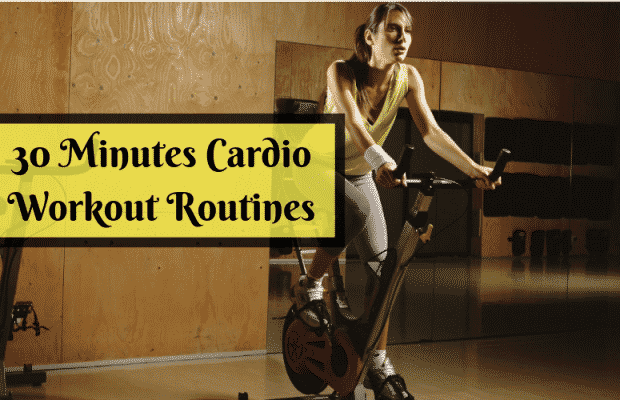 Continue at a speedy pace until and unless you complete 75 reps.
After reading the above writing, are you still afraid of cardio workout routines? I hope not.